"Ten years ago, Tatum’s book asked the question, Why Are All the Black Kids Sitting Together in the Cafeteria? Her latest book follows up with a broader question about the nation’s readiness to talk honestly about the forces that continue to make race such a thorny issue. In separate essays, Tatum probes the impact of continued segregation in public schools—mostly the result of segregated neighborhoods—on classroom achievement; the difficulty of developing and sustaining interracial relationships in a society that practices silence on race; and the longer-term implications of continued segregation on a changing democracy with a growing nonwhite population. 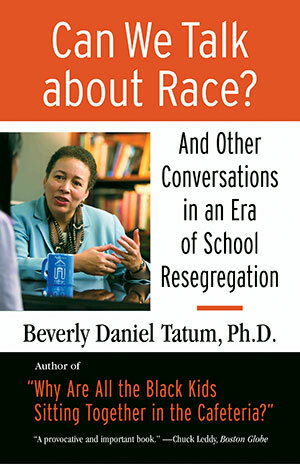 Tatum blends policy analysis and personal recollections as an educator and self-described “integration baby,” born just after the momentous Brown v. Board of Education decision, into a cogent look at the forces that continue to separate the races and the urgent need to begin an honest dialogue. Tatum’s analysis is a probing and ambitious start of a series of books to prod national discussion on issues of race, education, and democracy."